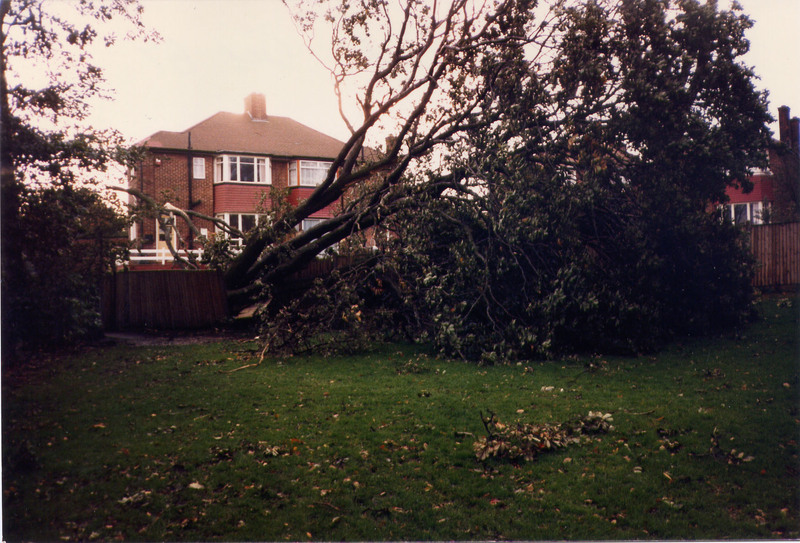 On the night of 15th to 16th October 1987 an exceptionally strong weather system hit southern England and northern France. A very deep area of low pressure developed in the Bay of Biscay and began tracking north east deepening all the time with dramatic increases in temperature across the storms front. 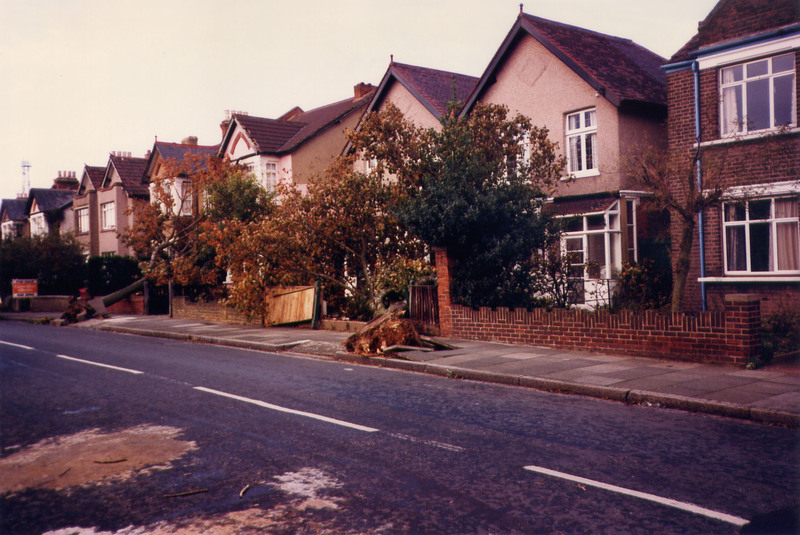 By the time people went to bed on the night of the 15th October no mention had been made of the severe nature of the approaching storm on national television and radio broadcasts. 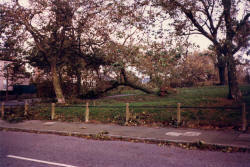 BBC Weatherman Michael Fish famously dismissed one viewers concerns outright. 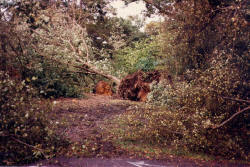 However severe weather warnings had been issued to the emergency authorities including the London Fire Brigade. 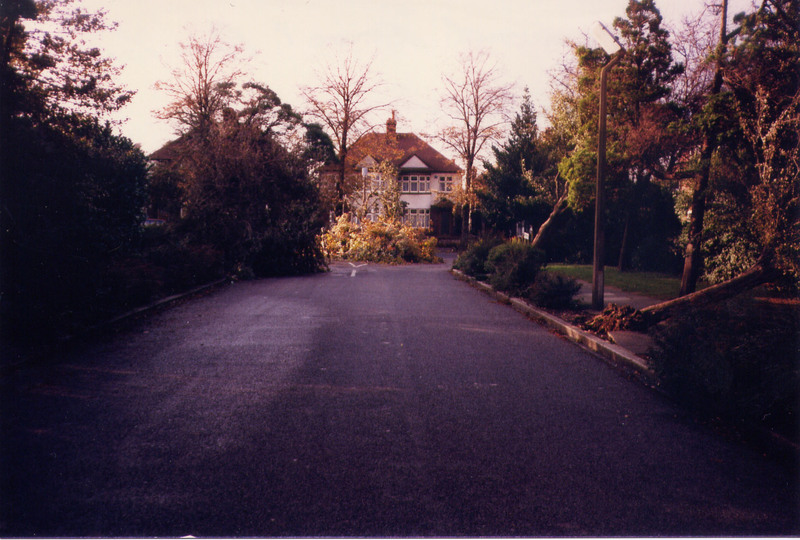 A later warning was then issued to the Ministry of Defence warning that the consequences of the storm might be so severe that the civil authorities may need to call on the military for assistance. 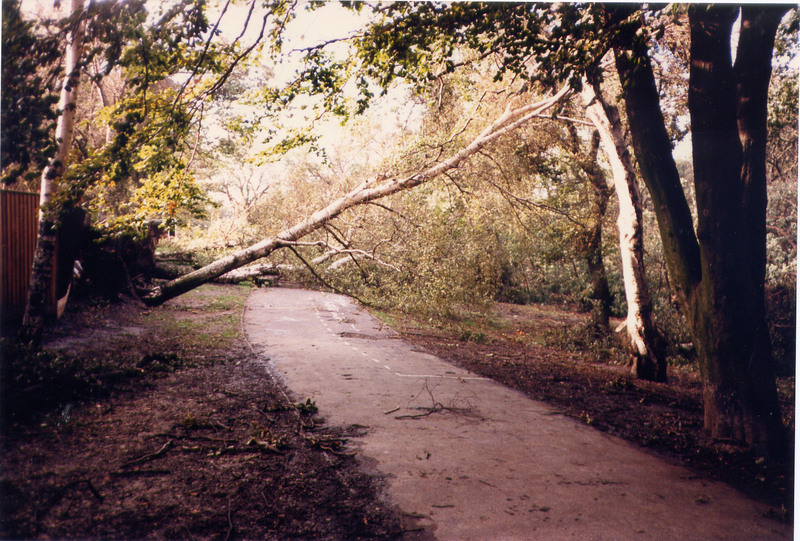 The storm made landfall in Cornwall and continued its north easterly path with winds veering from southerly to south westerly. 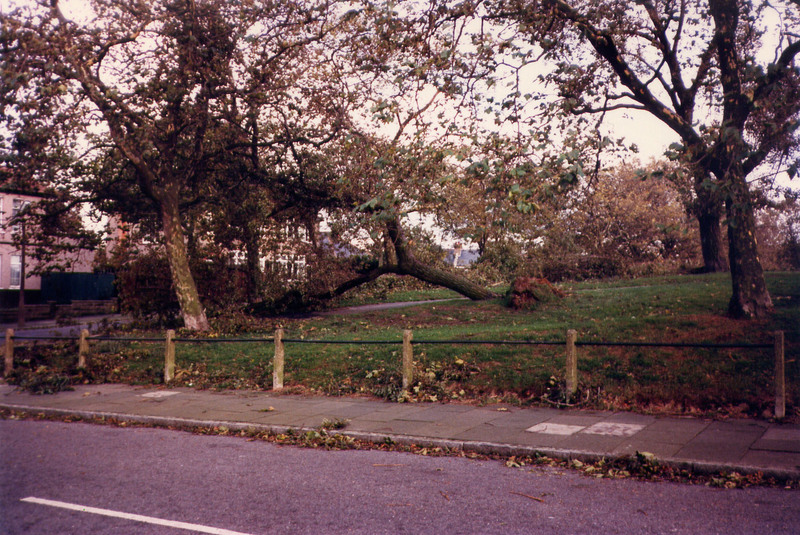 The strongest gusts of 120 miles per hour were recorded in Sussex, Kent and Essex. The following morning BBC Television centre could not operate due to power failure and BBC Breakfast Time was broadcast from a single camera emergency studio in central London, reinforcing the feeling of a national emergency. 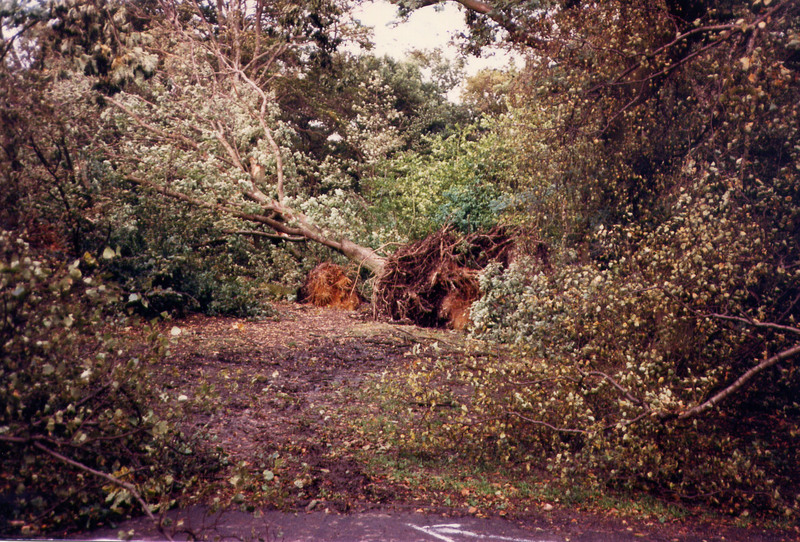 Unfortunately most of the south east would not have seen this broadcast as hundreds of thousands of people were themselves without power and in some places remained this way for weeks. Public transport in London had failed (nothing unusual in that) and people were advised against going to work. 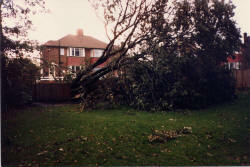 The aftermath of this storm on the estate can be seen from the pictures below. Click on the individual pictures for a full size image.